What if there exists 1 amazing pattern that keeps on repeating itself to pour money into your trading account? What if I told you that this pattern is also time tested for decades? What if I told you it has a success rate of 70% if you apply it properly? Once upon a time, in a small village, there was a hawker stall that became very famous because of its beef noodles. The stall only sells one thing. Noodles. And the secret of its tasty dish is the well guarded family "sauce". Tourists from all over the world flocked to taste its delicious beef noodle recipe. Soon it made the headlines in the newspapers as well as popular food blogs. Potential business partners sprung up like mushrooms. They all wanted to buy the formula for the secret sauce. The shocking truth of their success boils down to one thing: The Sauce. When it comes to the stock market, the secret to many great trader's success is one thing: One strategy or one pattern. They keep on trading the same thing over and over again and the trading profits keep rolling in like clockwork. That's their SECRET SAUCE. Sure there will be losses, but the big wins and gains using that ONE pattern far outweighs the losses which are just the cost of doing business in the stock market. Some people may call it stupid to do only one pattern. Its like having tunnel vision, they say. If you are a Malaysian and are wondering how to trade stocks in Bursa Malaysia, this is my gift to you. All I ask in return is if you find success somewhere in the future, do not hesitate to let me know your life changing story. Also do donate some of that profits to the less well to do. The time tested reliable chart pattern that I mean is non other than the ascending triangle. The image below shows what an ascending triangle looks like. This pattern is usually considered a continuation pattern. But it can also act as a bullish reversal pattern. I found this chart pattern appearing in stocks and commodities and trading instruments all over the world. So, the wisdom contained in this page not only helps you to make money in Malaysian stocks. You can apply this exact same strategy in stocks all over the world. You can even apply it to bitcoin, commodities and stock indices. I'm just showing you here how the ascending triangle seems to work very well in trading Malaysian stocks. The above 3 charts show some of the hottest stocks in the Malaysian stock market recently. They are Inari, Hai O and Hengyuan. 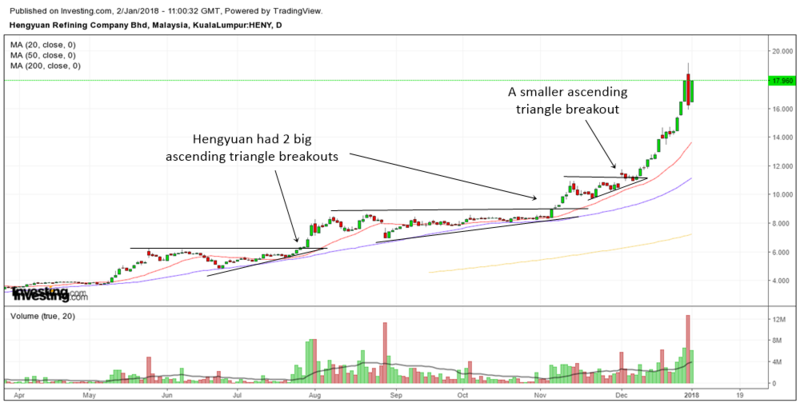 Is it just a coincidence that all 3 mega big winners exhibit the "ascending triangle" chart pattern? The secret I'm revealing to you is this : Many top gainers often create an ascending triangle pattern in their stock charts before they blast off to the sky. So how do you trade the ascending triangle? Basically you buy the breakout and put a stop at the lows of the pattern. That is the usual way to do it. I have written an article detailing the exact steps how to tackle this pattern. You will find some awesome tips on how to really trade the ascending triangle. This article will show you step by step how to trade this chart pattern and also how to manage the position. 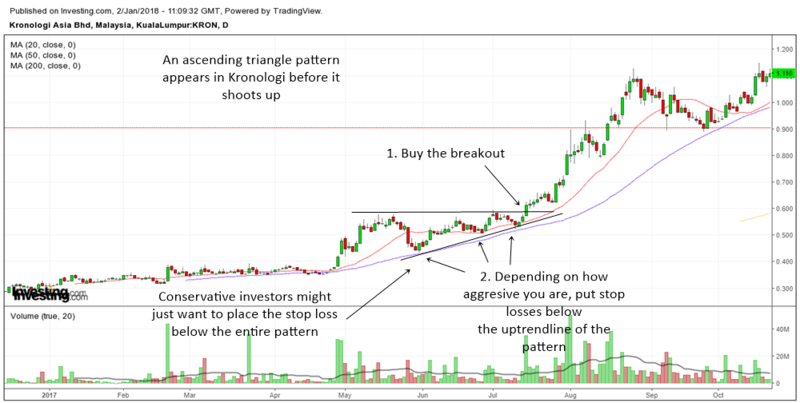 The chart above shows how to trade an ascending triangle in Kronologi. Traders should buy the breakout and then put a stop loss below the pattern. If you have been trading a pattern for a long time, you will eventually get to know the ins and outs of the trading strategy. You will also see lots of things that others won't see. Don't worry, I have done the hard work for you and below are some additional tips in finding the perfect ascending triangle trading candidates in Malaysian stocks. 1 or 2 superb trading candidates will appear each month. Be selective and trade the best. You deserve the best. An uncommon knowledge : Ascending triangles can be a bullish reversal pattern or a continuation pattern. 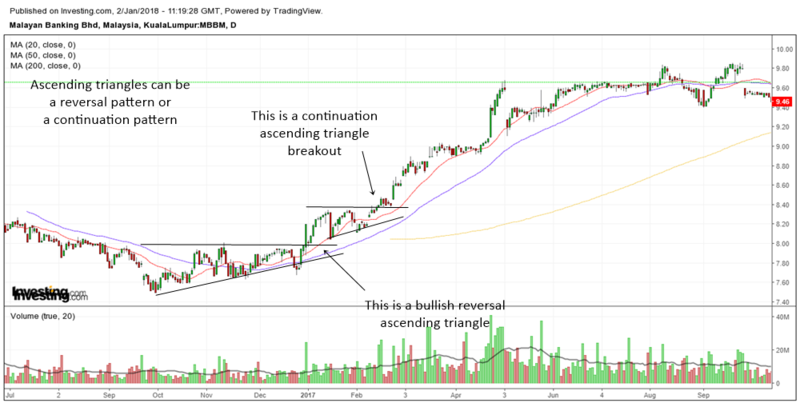 The chart of MBBM (which is the biggest Malaysian stock in terms of market cap) above clearly illustrates how the ascending triangle acted as a bullish reversal pattern as well as a continuation pattern. You can trade both of them. 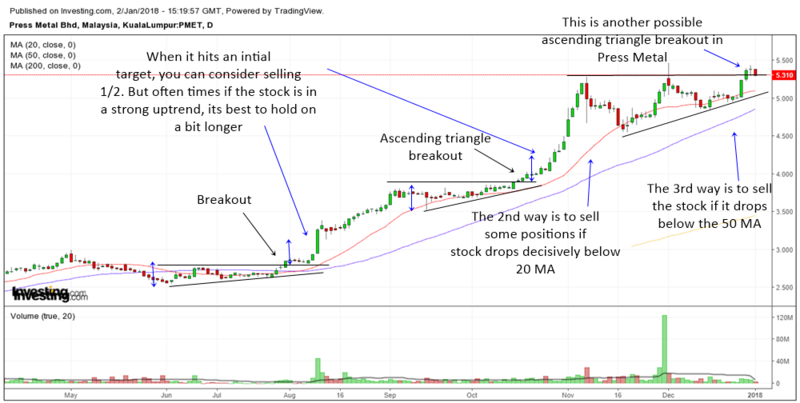 You will also notice that when the stock broke out of the ascending triangles, they are above the stock's 20 MA and 50 MA. 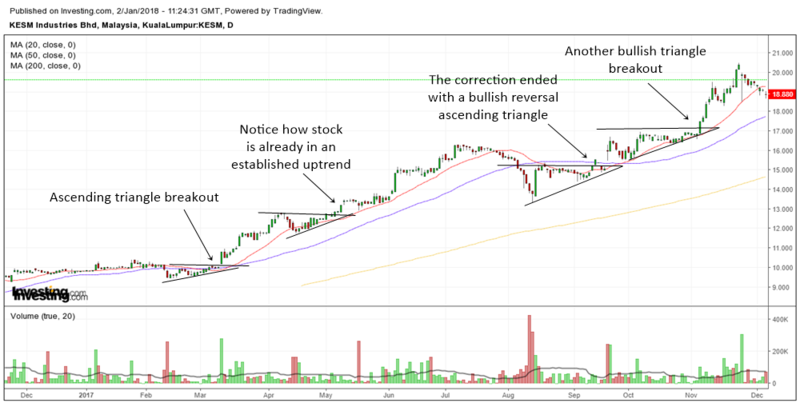 The chart of KESM further illustrates the power of an ascending triangle. There were quite a number of ascending triangle breakouts in this stock. If you had paid attention to it, you would have nailed some mouth watering juicy trades. Notice how this Malaysian stock was already in an established uptrend. The trend is your friend as they say. 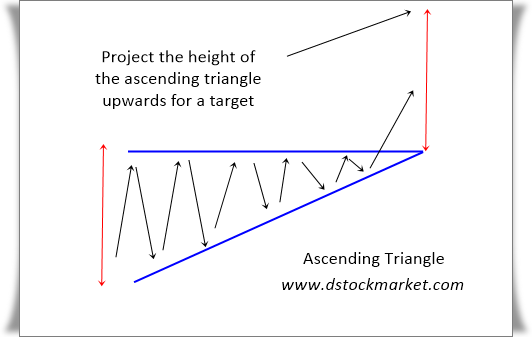 The ascending triangle offers the observant trader a way to enter a stock that is already in an uptrend. There was a nasty correction in August 2017 for KESM. But a bullish reversal ascending triangle appeared and helped to send the stock soaring up again. If you had missed that one, the stock was shouting out to you that there was another opportunity in November 2017. If you are wondering why KESM shot up so much, all you have to do is to look at the sector that it is in. 75% of stocks will rise or fall based on the performance of the sector index. A rising tide lifts most boats. 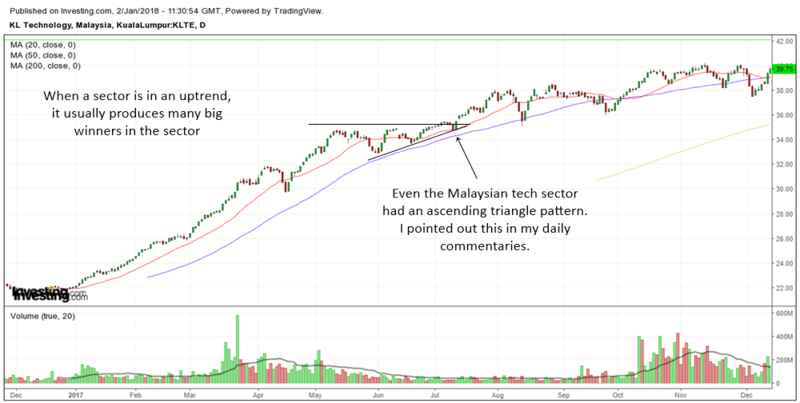 So the odds of you finding a successful ascending triangle in the Malaysian stock market lies in a sector that is in an uptrend. The chart above is the Malaysian Tech sector's chart. Just look at how beautiful the uptrend is. It is one of the shining areas in the lackluster Malaysian stock market. Those who invested in the Malaysian tech sector generally came up on top of others. By the way, notice how the ascending triangle appears in the sector's chart. Mind blowing isn't it? 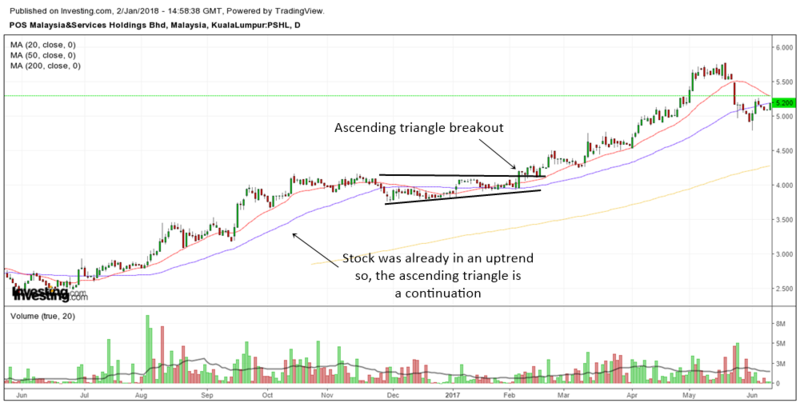 I'm just going to show you more and more examples of how the ascending triangle chart pattern has brought out some of the biggest winners in KLSE. Chart's don't lie my friends. Sometimes the ascending triangle can help you capture monster moves that happen within days. 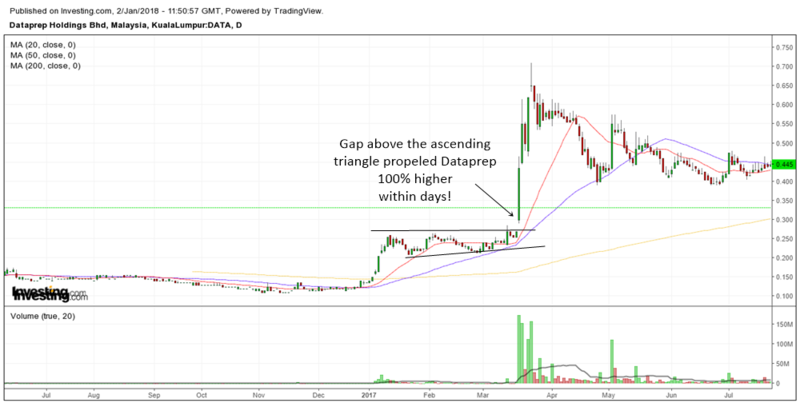 Dataprep back in March formed an ascending triangle. The stock gap up above the chart pattern and it immediately shot up more than 100% in just a few days. The ascending triangle is really the stuff of top traders. 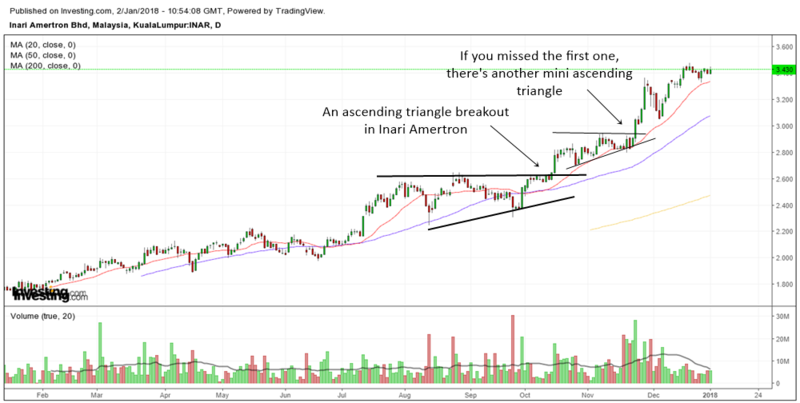 Back in April 2017, I helped a friend analyze this stock, Lion Industries and I pointed out to him Lion is forming an ascending triangle. Notice how the massive amounts of volume spike that happen before the breakout? CEO's and CFO's can always cook the books and lie about their company. But charts don't lie my friends. A stock that is forming a continuation pattern on heavy volume usually hints of extremely strong buying interest. Somebody somewhere knows something more than you and they are voting with their hard earned money. In the case of Lion Industries, its in the millions! 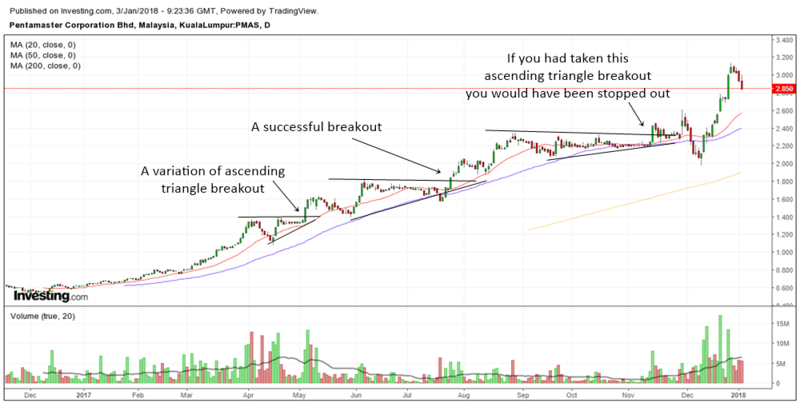 Pos Malaysia gave traders a nice ascending triangle continuation pattern. That's the beauty of this chart pattern. It appears in almost all types of stocks, even in a boring postal company. Now that you have an idea of how the ascending triangle pattern works, you need to know when to take profits off the table. There are plenty of ways to manage a trade. The first thing you need to do is to know 2 things. Let's take a look again at the first diagram I showed you in the beginning of this article. The ascending triangle provides us with a target. The initial target that you can expect is the height of the pattern. You take the height of the pattern and project it upwards from the breakout point to get the target. So, if your trading candidate hits your initial target, you can consider taking some profits off the table. Perhaps take 1/2 of it off the table. If the stock is in a strong uptrend, you can ride the other 1/2 higher. Most of the time, if you selected the correct stocks, you need to have some patience to hold on to the stock longer to gain more profits. Which bring us to another way to take profits. Another way to take profits is to sell some positions off the table if the stock drops decisively below the 20 MA. Lastly you can sell the entire position if the stock drops below the 50 MA. The 50 MA is often viewed as a gauge by fund managers about the health of a stock. If the stock drops below the 50 MA, it often tells us that more correction is around the corner. Another strategy to reap profits is to look at the risk reward factor. If you are making a 1:2 risk reward perhaps you might want to take some profits off the table. An example would be, you risked RM 25,000 on the trade and you are now making RM 50,000. You might want to take 1/2 of the profits off the table. Press Metal is one of those mega stocks in the Malaysian stock market. From the chart above, we can see how it gave 2 nice ascending triangle breakouts. A 3rd one might be in the making. If you have traded this stock based on the breakouts, you could have taken profits once the pattern target is met. But you would have shortchanged yourself because the stock is in a strong uptrend. Therefore, a trailing stop loss using moving averages might be a better alternative to catch the massive trend up. Traders could use the trusty 20 MA and take some profits if the stock drops decisively below the 20 MA. Or they could ride the superb trend up and sell only when the stock dropped below the rising 50 MA. From my personal experience, great stocks that shoot up like a rocket tend to stay above their rising 20 MA and 50 MA for a long time. Therefore, some patience is needed to gain the most out of the trade. 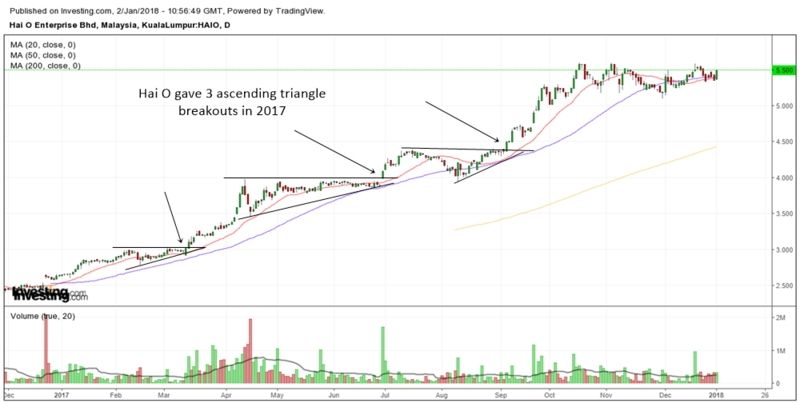 I have looked at some of the greatest gainers in the Malaysian stock market for 2017 and I realized that most of them had an ascending triangle pattern at least once. Some even have 2 or more ascending triangles developing as they shoot up. What this means is you have plenty of opportunities to make money in Bursa Malaysia KLSE. Who says the amateur can't make money in KLSE? In fact, I would go on to say that this is perhaps the best chart pattern to trade in Malaysian stocks for beginners. Seasoned traders can also benefit from this and add it to their trading arsenal. 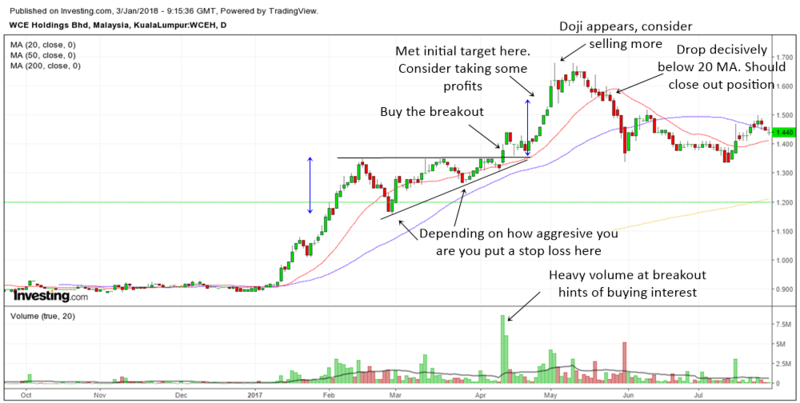 Can you use this chart pattern as an investment tool? Contrary to what many people believe, chart patterns can be used to aid investors. So, not only do traders benefit from chart patterns. Investors can also use the ascending triangle to time their entry or to simply add more shares to their portfolio. If the ascending triangle appears in a weekly chart, that is even more potent and powerful. Ascending triangles are great for Malaysian stocks that lack liquidity. It's difficult to day trade most Malaysian stocks. But you can certainly swing or position trade an ascending triangle in the daily chart of a low volume stock. 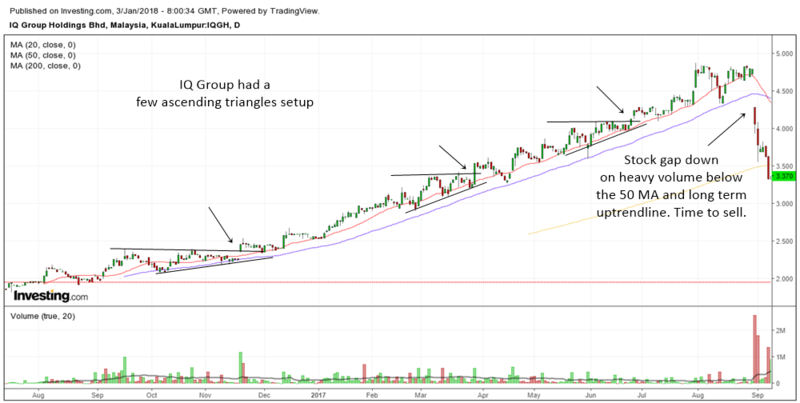 IQ Group which is a stock that has low trading volume exhibited a few ascending triangles before it gap down because of bad earnings. This stock provided a few trading opportunities for Malaysian traders. After the earnings, the stock gap down on heavy volume below a long term uptrendline and also below the 50 MA. This was a sign for traders to sell the stock. 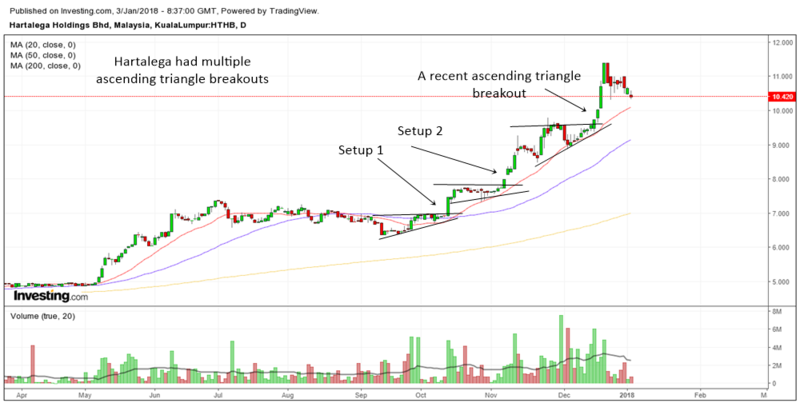 Hartalega is another great example of a Malaysian stock giving traders multiple ascending triangle setups in a short period of time. If you missed the first one, you could have gotten in on the second one. A stock that is in a strong uptrend may give you more than one ascending triangle. Sometimes an ascending triangle can take a few months to form. That is alright. The longer the pattern, the bigger a move in the stock we can expect. 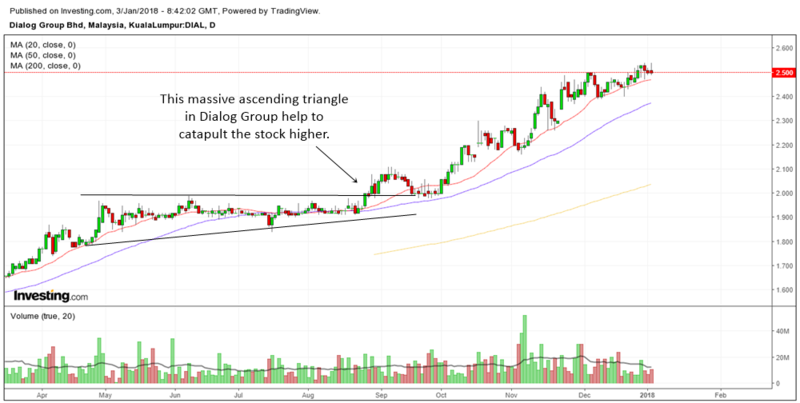 Dialog Group is a good example of how patience finally pays off for investors in this stock. 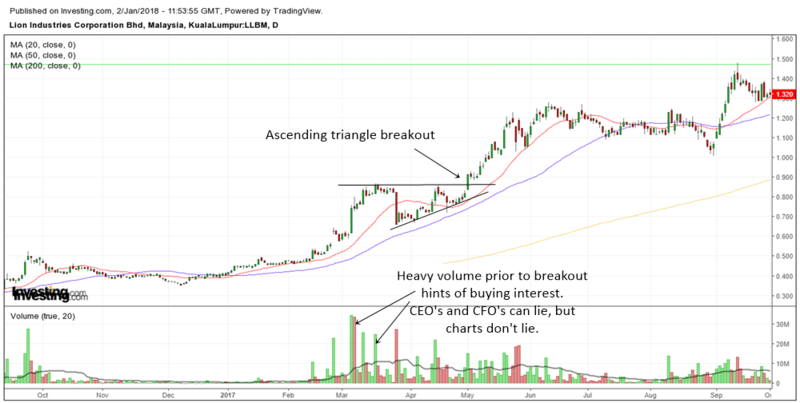 The stock formed an ascending triangle from May 2017 to August 2017 where it broke out of the pattern. See how high the stock went. 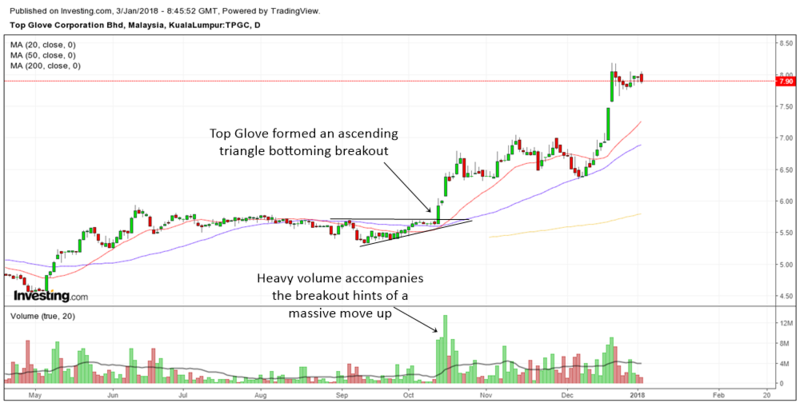 Top Glove which is another hot stock on the radar of many investors and traders also gave us an ascending triangle pattern. The ascending triangle was actually a bottoming type of ascending triangle. Remember earlier where I told you that ascending triangles can act as a continuation pattern as well as a bullish reversal pattern? In the case of Top Glove, the stock acted as bullish reversal pattern after the correction. 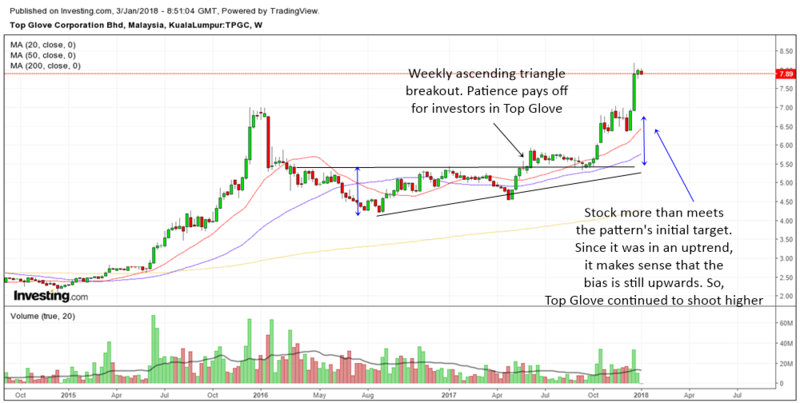 The chart pattern help to send Top Glove higher in the next few months. One of the great things about time tested and reliable chart patterns like the ascending triangle is its ability to cut across all time frames and be useful in them. Not only does this pattern appear in daily charts, it also appears in weekly charts. The chart below is the chart of Top Glove but this time I am showing you the weekly chart. Did you notice how the stock formed a weekly ascending triangle? One thing you should remember when trading weekly ascending triangles is the time factor. Since we are using the weekly charts, it makes sense to be more patient. One bar in the weekly chart represents one week. Therefore, more often than not, the process of breaking out in the weekly chart might take many months. But eventually it will pay off for the patient investor or trader. Weekly ascending triangles are also useful for fund managers as you will have a more longer term outlook than normal traders. The above is the weekly chart of Sunway Bhd. If you were wondering why it shot up so much in 2017, you only need to look at the ascending triangle that formed in the weekly chart. I have often found cheat sheets very useful. Whether for studies or on any topic, they act as a quick reference for students. So, right here, I'm going to list down the useful steps for you to find your own powerful trading candidates. You might want to copy and paste or print it out and stick it somewhere. Move your stop loss to breakeven when you are making a 1:1 risk reward. The more I analyze Malaysian stocks, the more I see how powerful the ascending triangle is in Bursa stocks. 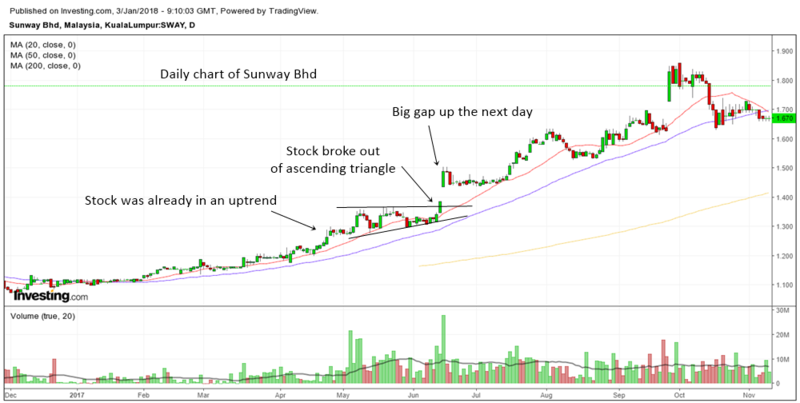 The above is the daily chart of Sunway. 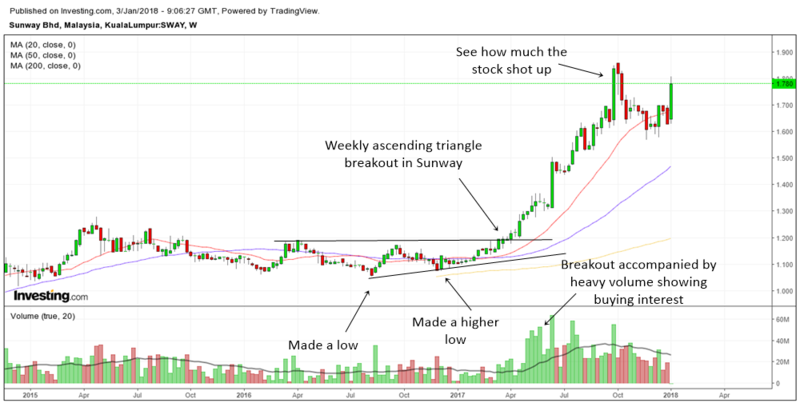 I showed you the weekly chart just now but it seems that ascending triangles also appeared in the daily chart of Sunway. Sunway was already in an established daily uptrend when the ascending triangle appeared. Right after it broke out of the pattern, the stock gap up big time. It continued to trend higher from there right up to October. WCE Holdings gave traders a nice few weeks trade when it formed an ascending triangle in its daily chart. Study the chart above and the notes that I have annotated and you will realize that it had all the ingredients that we mentioned. You can also learn how to take profits and manage your trades by studying more and more ascending triangle patterns that appear in the past. Forget a sure win setup/trading strategy/chart pattern. Forget about winning 90% of the time. You will lose money even on the most amazing setups. You will probably lose money a few times in a row. That's the honest truth that most marketers try to ignore. I have been trading for so many years and I have to tell you that there is no holy grail in trading or investing. But if you find a strategy that gives you a success rate of 60% and a good enough risk reward ratio, you will come out on top in the end. You need to have discipline to follow the rules in your trade. You need to have excellent money management, risking only a certain amount in every single position. Pentamaster is another hot Malaysian stock that gave two nice ascending triangle setups and a failed setup. The first one is a variation of the ascending triangle and it was a successful one. Meaning no losses. By the way, sometimes you need to recognize the variations of a pattern. Not all patterns follow the textbook type and the experienced trader will be aware of them. The second pattern is also another variation of the ascending triangle and it was a successful one. But the 3rd one was a failure. It looked good and it had all the ingredients of a good ascending triangle. But if you have taken the trade, you would have lost money in it when it slashed through the stop loss. The frustrating thing is the stock took out the stop losses and immediately shot back up higher. This is what we call a whipsaw. It can really make you feel frustrated and angry but no point beating yourself up with it. In trading, there will be lots of situations like this. To my Malaysian friends (and also readers from all over the world), I have shown you 20 examples of the mighty ascending triangle. This is perhaps one of the most powerful chart patterns you can ever trade. The great thing is it not only appears in Malaysian stocks. How The FTSE 100 Formed An Ascending Triangle And Shot Up Higher. This pattern appears again and again in stocks all over the world. Therefore, you can apply the principles here into any stock market in the world. I always believe that if you can make money in one market, you can make money in all markets. You now have an extremely powerful tool which you can use to generate monthly income for yourself in the stock market. Read this article again and again until you make the education here yours. If you find this helpful, share it with your friends and help them too.